What is a Healthcare Degree? It's no secret that the healthcare field is expanding--fast. The United States Bureau of Labor Statistics projects that over 4 million jobs will be added between 2012 and 2022. The healthcare field is growing, and because there will always be a high demand, this career field can provide job security unlike other careers. A majority of healthcare jobs, such as the list above, require a two-year Associate's Degree. There are a few jobs in the healthcare field that require extensive training and education before an individual can earn a healthcare degree such as becoming a registered nurse and general physician. 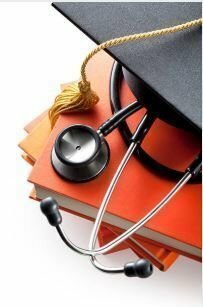 Due to the growth rate and changes to the healthcare system, obtaining a healthcare degree can be achieved easier. Universities and colleges have expanded their online courses to prospective students over the years. By offering flexible courses, but also allowing individuals to complete their degrees at their own pace, online healthcare degrees have become quite popular. Working in the healthcare field can also be stressful and require an extensive knowledge base. A healthcare degree can help an individual gain training when it comes to working in a stressful environment, but also guidance when it comes to communication and interpersonal skills that are needed in the healthcare field.